I read the first book set in Southlea Bay some time back and loved it. 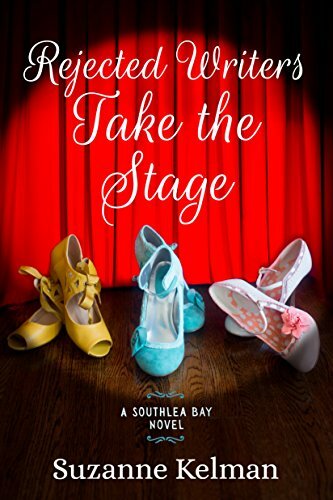 You can read my review here: The Rejected Writers Book Club So I was really pleased to be contacted by the author Suzanne Kelman to ask if I’d like to read the sequel, Rejected Writers Take the Stage. I’m pleased to say, I enjoyed it just as much. Although it’s a sequel, you don’t need to have read the first book as the story is completely standalone. If you have read the first book though, you will enjoy meeting the characters again. In this book, the ladies of The Rejected Writers Book Club are still happily receiving rejection letters for their work but this time have a new writing challenge to face. One of their number, Annie, is facing losing her home, and sanctuary for her rescue dogs, as she has fallen behind with mortgage payments. Her friends are determined they won’t allow this to happen and come up with the idea of writing and performing a play to help raise the money she needs. Meanwhile Flora, is delighted to find that her friend Dan is coming to visit but who is the clingy woman he brings with him? Once again I thoroughly enjoyed spending time with the eccentric ladies of Southlea Bay. I love the obvious friendship between them, despite their differences, and they way they rallied round to try to help Annie in her hour of need. The stage show Doris writes bears more than a passing resemblance to The Wizard of Oz and there were so many moments which made me laugh out loud. As soon as there was a mention of characters appearing in a cloud of smoke or being catapulted onto the stage, I knew it was going to be a hoot! Aside from the stage show, Flora’s blossoming romance with Dan is a major strand of the story. She can’t understand who this Marcy is who Dan has brought to Southlea Bay with him and although it’s obvious to the reader what is going on, poor Flora is very despondent. There are so many missed opportunities and misunderstandings between the two and I was willing them just to talk to each other properly. If only Marcy didn’t keep getting in the way! A thoroughly enjoyable read about the value of friendship and sticking together with lots of warm humour – I can’t wait to see what the ladies get up to next! You could easily read this without having read the other. This book doesn’t give away the plot of the first book and gives enough detail for you to get to know the characters. The first one is very good too though! I love the cover for Rejected Writers Take the Stage. This definitely sounds like my sort of read!